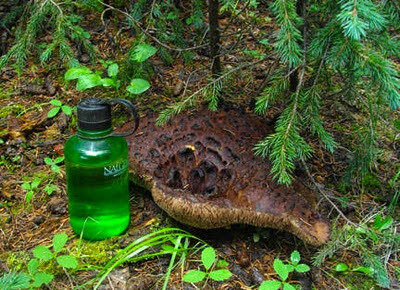 Sarcodon imbricatus (hawkswing) with pint Nalgene bottle for scale. The weather has turned monsoonal, with heavy rain almost every day. We are experiencing a condition known as humidity, from the Proto-Indo-European root *wegw-. Having recently visited Chicago and Vermont, I am prepared for such unusual conditions. And they have brought on the mushrooms! Yesterday M. and I took her visiting nephew mushroom-hunting in the Wet Mountains. We drove straight to our favorite spot, warning him that although sometimes it was like "going to the mushroom store," you can never be certain what you will find. That was far more than we could fit into the food dryer, so the rest are sliced into strips and spread on old window screens in the greenhouse. But with all the humidity, we may have to rotate those greenhouse mushrooms through the electric dryer after the first batch has finished. Labels: mushrooms, weather, Wet Mtns.